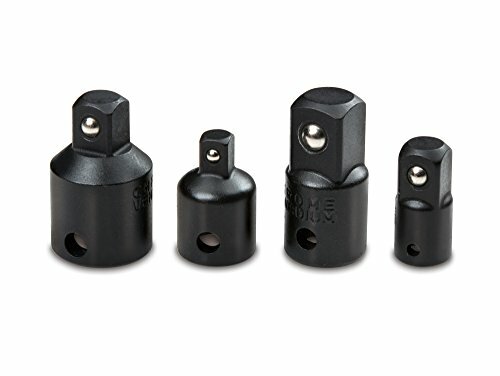 For this post, I have put together a collection of the best torque wrenches currently available. Never guess the torque of a fastener again. These high quality wrenches will allow you to apply the level of force to prevent overtightening or undertightening. The indicator bar remains straight while the main shaft bends proportionally to the force applied at the handle. The force exerted by the spring is overcome and the ball "clicks" out of its socket. This design yields greater precision as well as giving tactile and audible feedback. Measurement is by means of a strain gauge attached to the torsion rod. The signal generated by the transducer is converted to the required unit of torque and shown on the digital display. The following torque wrenches use the latest innovative components to meet your needs and help to ensure you do your best work. So here is my list of The 10 Best Torque Wrenches. Calibrated to an accuracy of +/ 4%, the TEKTON 1/2 in. 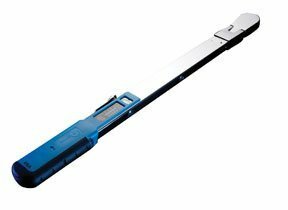 Drive Click Torque Wrench lets you work with confidence, eliminating guessing and the common tendency to overtighten fasteners. Correctly tightening fasteners to a vehicle or equipment manufacturer's torque specifications ensures parts are properly secured without being damaged. 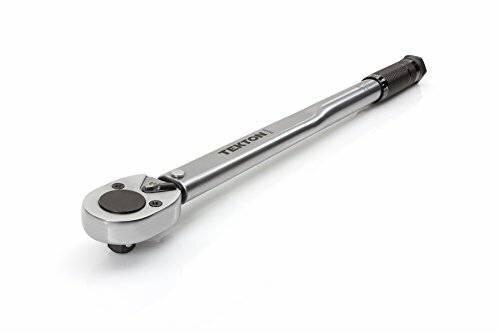 Simple and easy to use, this wrench has a reversible ratcheting head that drives fasteners in both directions and measures torque in the clockwise direction. To measure torque, set the desired value on the handle scale (foot pounds or Newton meters) and begin tightening the fastener. When the preset torque value is reached, a reliable mechanical operation inside the handle produces a click you can hear and feel, alerting you to stop applying force. Built for consistent performance and years of dependable service, the mechanical design doesn't need batteries. All-steel construction has no plastic parts to break or wear out. 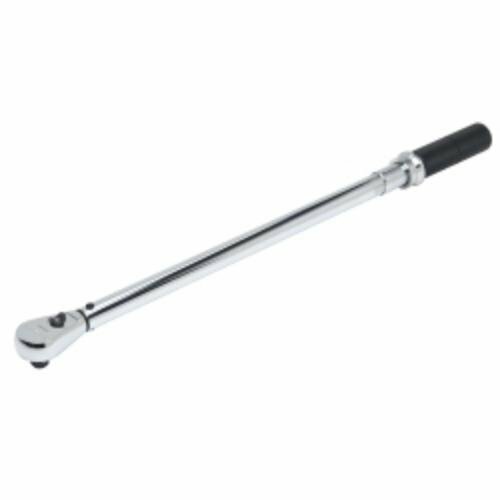 The EPAuto 1/2" Drive Click Torque Wrench with Durable Ratchet Head is made from Hardened treated Chrome Vanadium steel alloy (Cr-V). High Contrast and Dual Range Scale. Accurate: Pre-Calibrated to ± 4%. “Click” sound tells the preset torque value is reached. Sturdy plastic storage case is included. 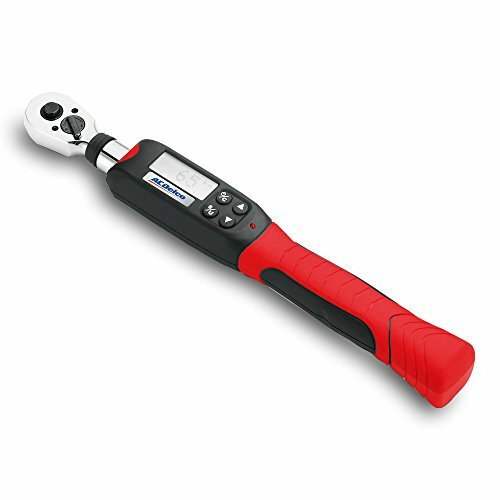 This CDI Torque 1/2-Inch drive adjustable micrometer torque wrench has a dual scale that is calibrated in dual direction and has a positive lock with spring loaded pull down lock ring. Fast and easy to set as well as easy to read laser marked scale. Features quick release buttons which provide good socket retention. Easy socket removal and an ergonomic comfort grip. Torque range of 30 to 250-Inch pounds. Don't forget the reducers and extensions. 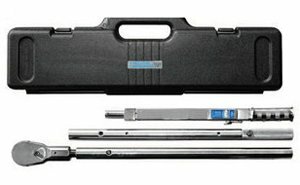 Precision Instruments PREC3FR250F 1/2" Drive Split Beam Click Torque Wrench requires only fingertip force since the adjustment mechanism is not under load. No need to "work in" a C series torque wrench before using it the first time. Not is it necessary to adjust to the lowest torque setting after use. Split-Beam Click Wrenches overcome many of the problems associated with micrometer-style clock wrenches in abusive environments. 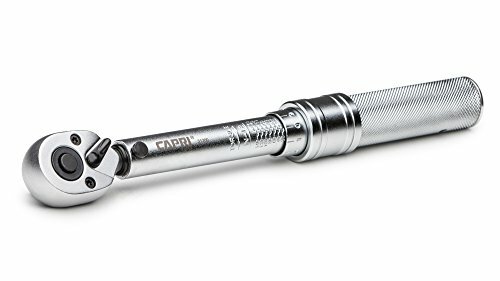 Capri Tools 31200 1/4" Drive Click Torque Wrench has a 1/4 inch drive and +/-3% clockwise accuracy, this torque wrench surpasses professional quality and meets industrial quality where every detail counts. Entire body is 100% steel with the knurled handles and a non-slip grip. 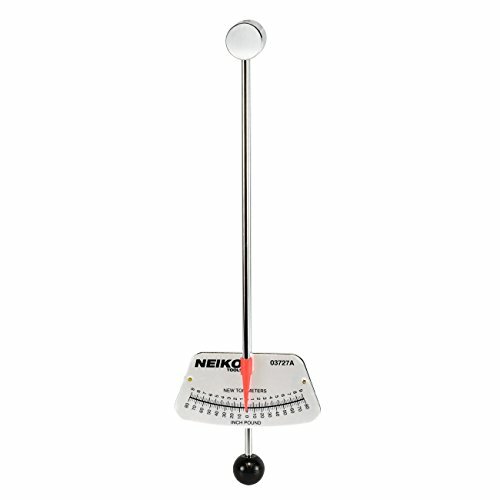 Engraved Foot-Pound and Newton Meter dual scale provides a vivid and clear reading of the measurement. Adjustment is available anywhere between 20-150 in-lbs. or 2.8-16.4 Newton Meters. GearWrench 85066 1/2" Drive Micrometer Torque Wrench 30-250 ft/lbs. The GearWrench 85066 1/2" Drive Click Torque Wrench features a Thin Profile, Sealed Tear-Drop Head Design for access and durability. Accurate in Clockwise Direction +/- 3% from 20% to 100% of full scale. Pull Adjustment Collar for easy and quick torque setting changes. Stamped Scale on Beam and Thimble Collar for durability and visibility. Knurled Anodized Aluminum Handle for comfortable grip. Mid-Point on Handle clearly marked for accuracy. The Neiko 03727A 1/4" Drive Beam Torque Wrench is manufactured to Exacting Standards to Assure Accuracy to Within +/- 4%. Offers Standard and Metric Readings, so conversion charts are not required. 0-80 in/lb in 1 in/lb Increments. 0-9 Nm in .25 Newton Meter Increments. Ambidextrous for Clockwise or Counter-clockwise use. 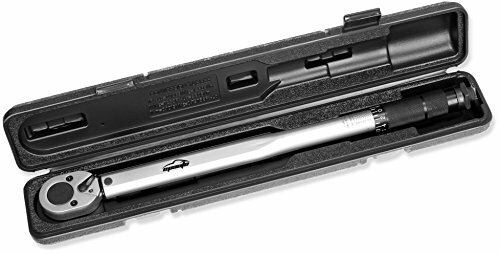 Precision Instruments PREC4D600F 3/4" Drive Split Beam Torque Wrench has the unique feature of having a removeable ratchet head that that allows the wrench to be broken down and stored in a case.. Extremely Accurate-Accurate within 4 percent of reading from 20 percent of full scale to full scale. Setting torque on adjustable wrenches is fast and easy because there is no spring tension on the adjustment knob. Does not have to be "turned down" after use 4% accuracy clockwise. All steel construction resists industrial fluids and abuse. The ACDelco ARM601-4 Digital Torque Wrench is designed to provide a more precise torque with various mode settings. Built-in audible buzzer and LCD display to show your measurement (ft.-lb., Nm, in-lb., kg-cm) settings. Torque setting, measurement setting, mode settings. 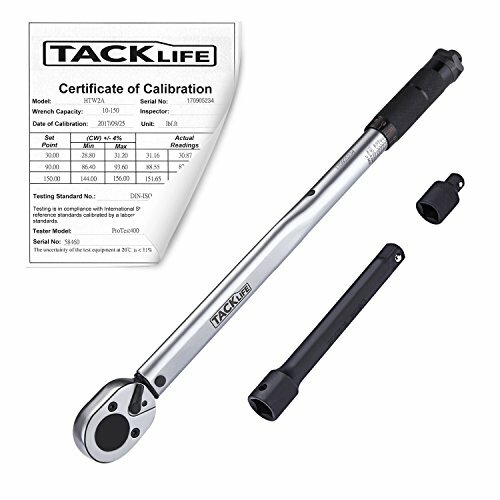 The Tacklife HTW2A 1/2" Drive Click Torque Wrench is calibrated one by one within +/- 4% accuracy before shipping, precisely suitable for cars, trucks, and lawn and garden equipment. Adjustment is available anywhere between 10-150 ft-lb or 13.6-203.5nm. 24 teeth bi-directional ratchet structure, adjusting position of the pawl to achieve intermittent motion in both directions. 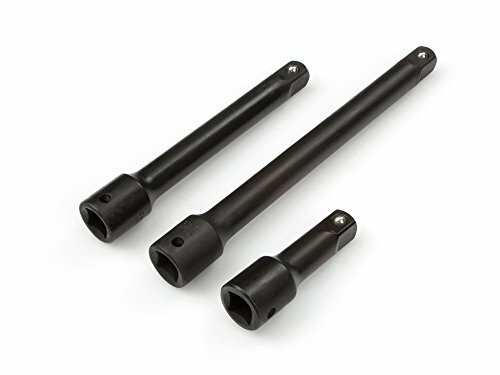 Knurled handles are made of alloys that are beautifully durable, maintaining firm grip, preventing slipping. Easily set and lock your torque range with the bottom adjustable ring to avoid over or under tightening, a clear "click" sounds upon reaching the set torque. Dual-range (ft-lb/Nm) scale setting, it reaches a high contrast, easy to read even in low light conditions. Comes with extra 1/2 in. drive(F) to 3/8 in. drive(M) reducer, 1/2 in. drive impact socket extension bar in a case. 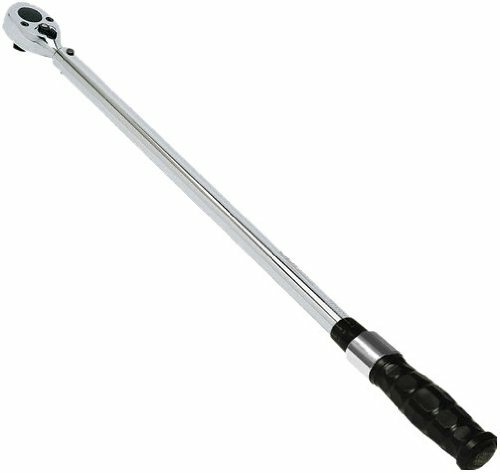 I hope this list of the best torque wrenches was helpful.